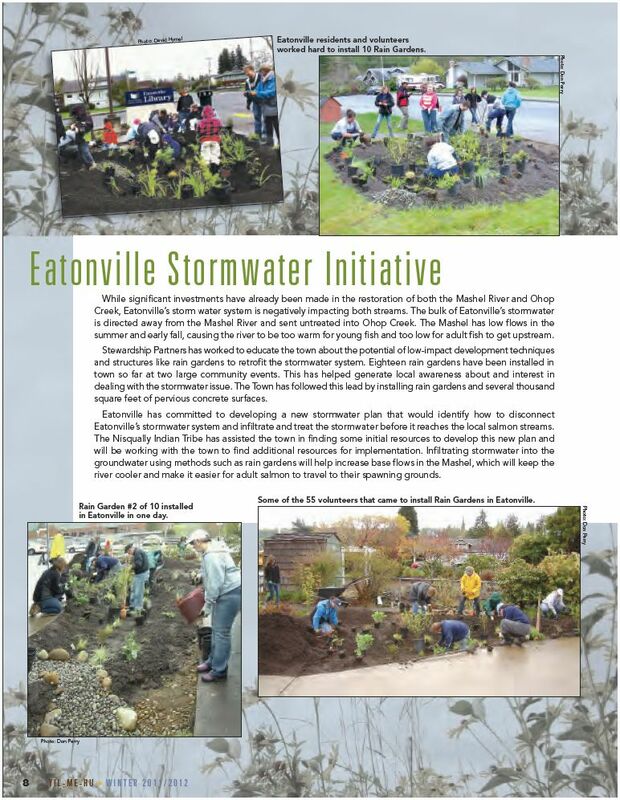 The Town of Eatonville, WA, in Southeast Pierce County, has embarked on a journey to infiltrate 100% of its stormwater. Nestled between Ohop Creek, Lynch Creek and the Mashel River – valuable salmon spawning tributaries to the Nisqually River – 80% of the Town’s stormwater goes untreated into Ohop Creek. Extra stormwater runoff that would help increase the low summer flows in the Mashel River also goes into the Ohop. Efforts are underway to reverse much of this through creative stormwater planning using low impact development tools, such as rain gardens. Eatonville is already creating a regional buzz with its rain garden installations, boasting 21 rain gardens and the highest per total population of any jurisdiction in Washington State. These rain garden projects became possible through a diverse collaboration led by Stewardship Partners: Nisqually Tribe and Stream Stewards, Nisqually River Council, Town of Eatonville, Rain Dog Designs and local businesses, KIRO Radio, and many Nisqually River Watershed volunteers. Follow Eatonville’s progress on this website and in publications from the Nisqually River Council. The Eatonville Stormwater story begins on Page 8 of this edition of the Yil Me Hu.